Good bloggers go to San Fransico, Bad bloggers go to BarCamp Berlin 3. At least, I’m hoping that’s what will be written on the BarCamp Berlin 3 T-shirts. BarCamp Berlin 3.0 is setting up to be the coolest blogging event of 2008, and probably one the best held so far in the history of the BarCamp. Paris has flair, Zurich beauty, and Detroit has true grit. But Berlin is one of those unique cities with an excellent mix of history, tech, art, design, and badassness. In Berlin the people are hip, beer is plentiful, and the clubs get hotter as the night turns into morning. It’s also easily one of my favorite places for photography in the world. Berlin is a city in flux, it has a flow, and between new buildings filled with new ideas the old walls give the determined poet inspiration. I could easily spend a month there, but this is the wrong attitude. If you spend a month anywhere you run the risk of getting comfortable. Better to enter and leave the environment as harshly as possible, keep the mind alert and the senses hightened, otherwise you’ll miss what you came for. It’s all the more interesting when you have to push youself for a few days with little rest. 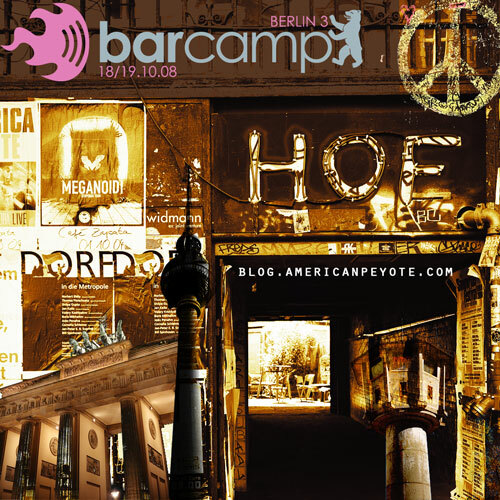 First, the main deal: there are something like 650 participants from Germany and around the world attending BarCamp Berlin 3 (Oct. 18th and 19th), and it kicks off a Web 2.0 week in Germany. Two big parties are happening on Friday and Saturday night, with the camp festivities starting Saturday and ending on Sunday. Sponsored by a number of tech companies, including Oracle and Nokia…I’m incredibly geeked about attending. Of course, to get in, you have to be on the list. Getting on the list wasn’t easy, the day registration opened I followed the link in my email only to get denied on the spot, because it seems like the available spots were filled up in a near simutaneous flurry of internet mouse clicks. Fortunately for me, the cool folks at BarCamp Belin had reserved space specifically for international guests. Since I come from the US and live in Zurich, I seemd to qualify. This naturally brings up what I would do at BarCamp. The concept, as with every barcamp is no spectators, you give a talk, volunteer or blog about the blogcamp. I’m always in the presentor category. Not because I know what I’m talking about, but some days you like to hear yourself speak, and preparing a talk means you have to have a grasp of the content. This isn’t like attending a scientific conference where only two people out of twenty will be able to understand the words flowing out of your mouth. At a BarCamp you want to communicate ideas for the pure sake of spreading knowledge and inspiring people. My last apperance was at BlogCampSwitzerland3.0, where I rambled on about integrating Flickr and blog content. As a speaker, I always come out of the process with a deeper understanding of the material and of myself. Additionally, speaking reaffirms how much I don’t know about the world. I like to think I offer a unique perspecitve, trained as a research engineer I blog about cameras, photoshop, creativity, phtography and produce imagery for Flickr. My main interests for BarCamp Berlin are delving into the production process of visual imageray for blogs, and distributing that content in diffenet ways on the web. My video production skills are improving, and I’ll post my talk in two or three videos after the show. Now the only question is what to pack? I’ll take three cameras to Berlin, burn through as much Velvia film as possible in 35mm and 645 formats and try to capture the feeling of the adventure. Street sounds and poetry will be handled with my Zoom H4 digital audio recorder. My short list of cameras includes the Ricoh GRD, Contax G1, and Fuji GA645 (wi) cameras. The Contax G1 might not make sense to some people – who still shoots 35mm in a digital world? Well, here’s a better question, how can one spend time photographing in place like Berlin and not do it with Carl Zeiss lenses? You always learn things better when you figure out how to best teach them to others. That’s the ultimate goal for teachers. Instead of blabbing out all your knowledge to listless students, have them teach material to others. Berlin sounds like fun! I can’t wait to see the photos. I shoot 35mm in a digital world. Usually it involves Tri-X at ISO 800 or beyond. A larger format wouldn’t show the grain. If I want giant gobs of grain, shooting medium format would miss the point! There’s still room for 35mm. It’s lo-fi and sometimes just the right ‘fi’. And sometimes I shoot 35mm velvia at family functions, just to be difficult. So you bring those Zeiss lenses and give ‘em a work out. I have to admit, although digital is great for studio and lighting work, I love Velvia and my Contax G1 when it comes to travel photography. I love the colors, the Bokeh, the sharpness, getting slides back in the mail always brightens up my night. Some of my favorite photos were shot in Detroit on 800 speed Ilford.